What says summer more than the mouthwatering taste of a syrup-drenched cup of shaved ice? Yes, I had my first snowball of the season yesterday. And yes, I slurped down every last drop of that pineapple strawberry goodness. My boss actually introduced me to this flavor combination, and I must say, it’s quite an experience. So yesterrday afternoon, he sent me on “mission” to retrieve snowballs for the two of us to enjoy at the office. I put up no fight. This was one mission that I was determined to see come to fruition. Fortunately, I didn’t have to travel far to spot a snowball stand. It seems that New Orleans caters to the snowball lovin’ crowd. In fact, I learned today from wikipedia.com that, “In 1934, inventor Ernest Hansen patented the first known 'ice block shaver' in New Orleans, Louisiana... His wife Mary created many flavors of fresh syrups to flavor his finely shaved artificial ‘snow.’ ‘Snowballs’ have been popular in New Orleans ever since.” I think Ernest and Mary are my new favorite couple! I also learned that, “There are differences between a New Orleans ‘Snowball’ and a ‘Snow Cone.’ A Snow Cone consists of hard, crunchy, grated ice and moderate amounts of syrup. 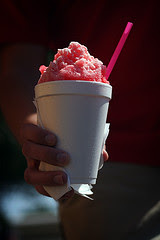 Snowballs are made from shaved ice the consistency of snow, with much more syrup [praise God!] , and are eaten with a straw and spoon.” Yes! Now I have a defense for the out-of-towners who look at me funny when I use the term “snowball” instead of “snowcone!” I won’t feel so unrefined anymore! (haha) So I urge you friends, if you haven’t gotten a snowball yet this year, find the nearest stand, and place your order! You won’t regret it!